This fast-selling power shower is similar to a mixer shower but has the shower pump built in which increases the rate of water flow through the shower head thereby adding an extra boost to your showering experience. They require a hot and cold water supply which must be above the shower pump to prevent the intake of air in the system. Bristan have a selection of thermostatic power showers that will guarantee a luxurious shower every time. 15 minute motor rating (unit will need to cool down if thermal cut out trips). 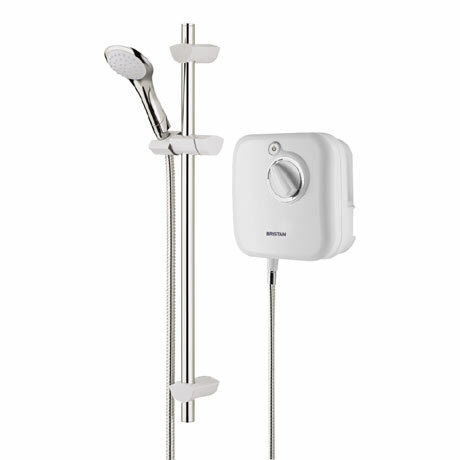 Thermostatic shower with built in electric pump drawing water from gravity supplies. On/off operated by push button allowing temperature setting to remain the same after each use. Supplied with 1.5m hose, adjustable riser kit and 3 mode handset with rub clean nozzles. The riser rail has a built in soap tray, hose retainer and spirit level to assist in fitting and as it fits flush against the wall and previous fixing holes can be concealed. Under no circumstances should the power shower be connected to the mains water supply. Guarantee - 2 years covering manufacturing faults.